Discover the radical truths & myths of skin care product claims & Promises! 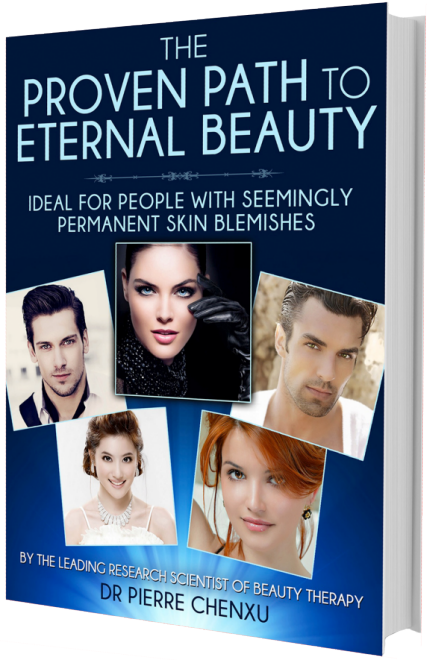 'The Proven Path to Eternal Beauty' is a compilation of random personal beauty questions from the public & Dr Pierre's customers, and his corresponding answers. Throughout this 200-page eBook, Dr. Pierre seeks to help you better understand the true nature of the onset of various skin flaws and to find a solution for your persistent and long-lasting skin flaws. And if you do not suffer from any major blemish, this book will also reveal the radical truths and myths of product claims, and you will NEVER again be deceived. This book is based on his long years of tried-and-tested experience in the field as a research scientist, ITEC practicing beauty expert, pioneer ITEC beauty therapy teacher and formulator of international Award-winning Herbal Cosmeceuticals & trend leading products. Dr Pierre advices from a position of Practice, Knowledge, Competency and Experience, and not from hearsay theories copied from the world wide web. These are the skin blemish topics in discussion inside - based on real life cases - each begins with a passage, or more, of clear & systematic illustration with multiple high-res pictures and explanations. There are more tips crammed into this little book than you'll find in a hundred hours of Google searching, or in product-driven beauty books. Get your copy now, and be in control of your own complexion!